THE CINDERELLA PROJECT Ready for School Bookings! 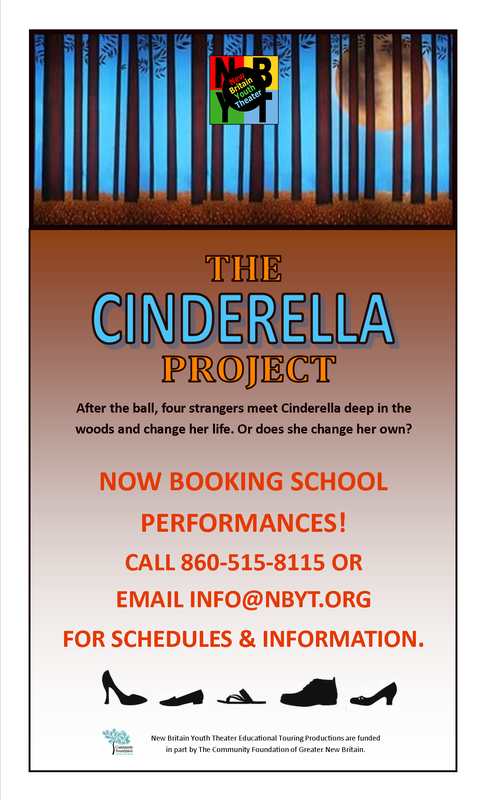 New Britain Youth Theater’s first original touring production for young audiences, The Cinderella Project, is several weeks into rehearsal and ready for school bookings! In The Cinderella Project, as Cinderella runs from the ball, she meets five strangers in the woods. These strangers are a narrator (who will become very important in Cinderella’s own story) and the lead characters from four other Cinderella-like folk stories from around the world. The characters include Rhodopis from Egypt, Mpunzanyana from Africa, Billy Beg from Ireland, and Arcia from Mexico. Also featured in the production are several puppets portraying animals and other magical characters. Together, the characters teach Cinderella that the power to change her life is within herself and not just with a prince, a fairy godmother, or fate. The Cinderella Project will run approximately 40-45 minutes and can be followed by a discussion or question and answer period with students. All students attending performances will also receive a program and study sheet to encourage pre-show or post-show discussion in their classrooms. The Community Foundation of Greater New Britain has funded the development of this program along with initial performances in New Britain elementary schools. Other schools and districts interested in bookings or more information should contact Executive Director Darren Farrington at 860-515-8115 or darren@nbyt.org. NBYT THE CINDERELLA PROJECT Ready for School Bookings!